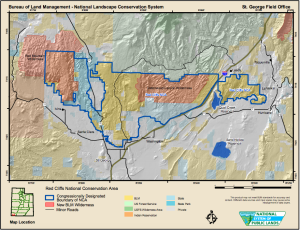 ST. GEORGE – An agreement approved by Washington County and the City of St. George this week will allow city officials to be more directly involved in discussions with the Bureau of Land Management and the county concerning the federal agency’s proposed plans for public lands within the county. The BLM’s draft resource management plan, or RMP, contains four alternative proposals for the future management of the Beaver Dam Wash and Red Hills national conservation areas. When the RMP was introduced last fall it received heavy criticism from county and municipal officials due to worries that facets of the plan could negatively impact the county and its municipalities. One of the prominent complaints against the BLM’s proposed plans is that, in all the time the agency spent putting the RMP together, it did little to consult or coordinate with county or city officials. That has changed in recent months as communication between the entities has improved and is expected to continue to improve under an interlocal agreement approved by the City Council Thursday. The agreement, made with Washington County regarding coordination on the BLM’s plan, will allow the city to directly take part in negotiations between the county and federal agency. “It’s an agreement between St. George and the county where the county will rely on the City of St. George for expertise in regard to the resource management plan,” Washington County Commissioner Victor Iverson said. The commission approved their side of the agreement Tuesday. The city had been unable to get a seat at the table and directly address concerns because it had not entered into a memorandum of understanding as the county had. The city had the option of signing its own memorandum, but it would take months to finalize. Instead, the city ended up piggybacking on the county’s original memorandum with the BLM. 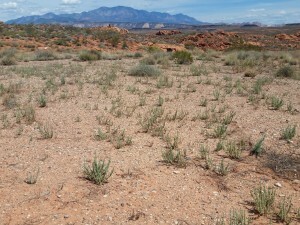 The idea to piggyback on the county came from Brian Tritle, field manager of the BLM’s St. George Field Office, St. George Mayor Jon Pike said. “I appreciate Brian Tritle … for suggesting this and allowing the process to happen so we can, in a sense, be equal partners in this,” Pike said. During the City Council meeting Thursday, Pike said it bothered him that the city wasn’t able to take the direct approach with a memorandum but also noted that the interlocal agreement provides an immediate path for the city to jump in and join negotiations through the county. As well, while the county has specific issues it wants to address, Pike said, the city has its own. With the interlocal agreement in place, the city will now be order to address its concerns directly with the BLM. Traditionally, Iverson said, it’s usually state and counties that deal with the BLM as cooperating agencies and not the cities. However, he said, the City of St. George had a bit more standing within the county under language written in the Omnibus Public Land Management Act of 2009. The 2009 omnibus bill is touted as a collaborative effort between federal and local agencies that saw the creation of the two national conservation areas. Local leaders have long said it also mandates the BLM coordinate with the county and St. George in relation to the management of public lands in the region. The BLM came under scrutiny in January during a congressional hearing held in St. George. Utah Republican Reps. Chris Stewart, Jason Chaffetz and Rob Bishop participated in the hearing, as did other Republican members of congress. They expressed their own concerns about complaints over the BLM’s lack of communication with local entities. In the wake of the hearing, Pike and Iverson both said communication with the BLM has greatly improved. “From the BLM’s point of view, we certainly want to communicate well with the City of St. George,” Tritle said Friday. 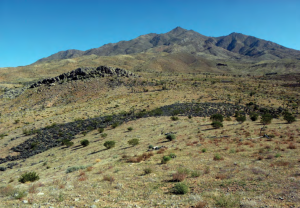 From the BLM’s perspective, Tritle said, the interlocal agreement provides an official means by which the interests of the City of St. George will be presented and represented though the county. Like Pike, Iverson said Tritle has been very good to work with; “We’re finding a resolution on a lot of areas of concern,” he said. There is one notable exception – the proposed northern corridor. Civic leaders in Washington County say the possibility of the road was promised by Congress in the 2009 omnibus bill. The BLM isn’t so sure about that. A proposed route of the northern corridor would place the roadway between Red Hills Parkway and Interstate 15 at Exit 13. The route cuts right through the desert tortoise habitat, something that conservation groups opposed to the road aren’t very happy about. County officials are also not ruling out the possibility of legal action should the roadway be denied. For the time being, Iverson said, the county is focusing on resolving other issues before tackling the northern roadway. Whatever the ultimate fate of the northern corridor, Tritle said the plans are still in the preliminary phases and much work is yet to be done. “I’m happy with how things are going,” he said, “but we still have the rest of the process to go through,” adding the BLM is meeting regularly with local civic leaders. In this matter, my husband an I strongly oppose the north corridor as it would negatively impact the tortoise population. The Red Hills Parkway is enough encroachment. The corridor is only a convenience for people, and the time saved with the proposed north corridor is not important enough an issue and does NOT outweigh the need to protect the wildlife in the Red Hills area. If the desert tortoise was native to southern Utah I believe we should be consider stopping the northern corridor route. The tortoises were brought here by local people who picked them up in Nevada/Arizona and brought them here as pets. They are not native. The St. George area is the northern edge of the Mojave Desert. Mojave native species include the Joshua Tree, Creosote bush, Gila monster, sidewinder rattlesnake, and desert tortoise. The population was supplemented as you say, but the desert tortoise is still a native. You are exactly right and thank you for providing information to rickolsen and others. County Commissioner Iverson said: “We believe the BLM is having a hard time interpreting the language of the lands bill very clearly. We feel the intent of Congress is clear that they need to designate a route.” That is wishful thinking on Mr. Iverson’s part. The Omnibus bill says nothing about building a northern corridor where the local leaders want to build it. 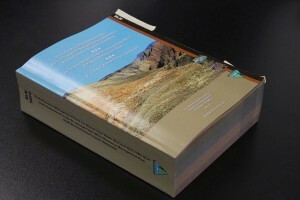 It only tasks the BLM to possibly identify one or more or even none in the transportation section of the Omnibus bill. Orrin Hatch’s bill to mandate such a road as an amendment is stalled in Congress. Sounds like a plan to keep things under wraps…and quiet. Greed, greed, greed…its scary what they can pull over the publics eyes without them even knowing. I guess all those lines in the sky are doing they’re job. Everyone look up…very good…”why?” So you don’t see what just went by…which is nothing BTW. Turquoise still has them staring. Hopefully, just hopefully something harmonious proceeds! They’re going to do whatever they want anyway ! Of course! I don’t know why they even bother to ask the public? They save it…until proper paper looking excuses taped to backs of desert turtles that THEY brought here…planned long ago! Think they’ll tell you that a certain element was mixed with blue clay to make stucco…as well as possibly casted within the red rocks like “molds”? Ohhhh well! Yup…they will. The City of St. George, UDOT, and FHWA determined that the anticipated implementation challenges and potential environmental effects, as previously described, would be substantial and thereby eliminated the Northern Corridor Alternative from further consideration. The Northern Corridor Alternative would not meet the objective of minimizing impacts to the reserve. …traffic demand along St. George Boulevard would still exceed the road’s capacity, so the effect may be minimal. Additionally, the 2015 Dixie MPO Regional Transportation Study showed in the draft report maps that the road would not relieve traffic on Bluff Street. There would still be traffic congestion. So, why are taxpayers having a $100 million road that would hurt our NCA and the threatened species it was established to protect forced down our throat by the likes of Iverson, Pike and others who have no real justification for demanding it. They seem like spoiled children: I want it because I want it!! Probably, but there is good support for a lawsuit for those who oppose. Perhaps letting the courts decide what the 2009 Act actually says is the only answer.